Lauren Sweet was born and raised in Stuart, Florida. She received her B.S. in Environmental Science from the University of Florida and earned her Ph.D. in Environmental Toxicology from Clemson University in 2015. Lauren is a postdoctoral fellow on the RECOVER project working with Dr. Aaron Roberts University of North Texas. Ultraviolet light, or sunlight, significantly increases the toxicity of oil to fish in a phenomenon known as photo-induced toxicity. Lauren will utilize her toxicology background along with molecular techniques to understand the mechanisms contributing to the increased oil toxicity in the presence of sunlight. 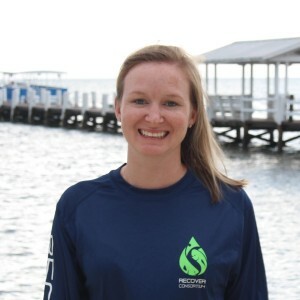 She is interested in understanding the pathways and metabolic costs to mahi and red drum when they are exposed to UV light and oil at early life stages before melanophores have developed. Her dissertation work was also related to fish behavior and she is interested in examining potential behavioral impacts of photo-induced toxicity.